A community art project based in eastern Tokyo that kicked off in October. This is the fifth installment in a series of articles produced collaboratively by the Tokyo Culture Creation Project and Tokyo Art Beat. 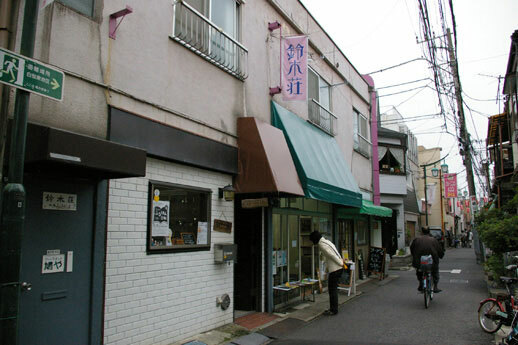 In this piece, TABlog writer Rie Yoshioka takes a look at the community-based art project “Bokuto Machimise 2010”, centered on the Bokuto* district of Tokyo, an old-fashioned area of narrow back alleys and small, intimate streets reminiscent of the Showa era. The festival’s core program of art exhibitions, walking tours and other events took place from October 2 through November 23. Here are some of the highlights from this community-centered art project, unfolding in an area of Tokyo that retains much of the old downtown shitamachi charm of the city, while also offering visitors a glimpse of the new face of Tokyo. Visitors to this part of Tokyo often find themselves smitten with the neighborhood by the time they leave. The Bokuto area has carefully nurtured its own way of life conducted to a different beat: a unique sense of time that you cannot help getting drawn into. This year’s Bokuto Machimise festival unfolds against the backdrop of precisely this sort of neighborhood, spread out over a fairly large swathe of Tokyo’s Sumida ward. Located an eight-minute walk from the closest train station, Higashi Mukojima, the House of Atreus also doubles up as an information center that provides visitors with all the latest information about the festival. 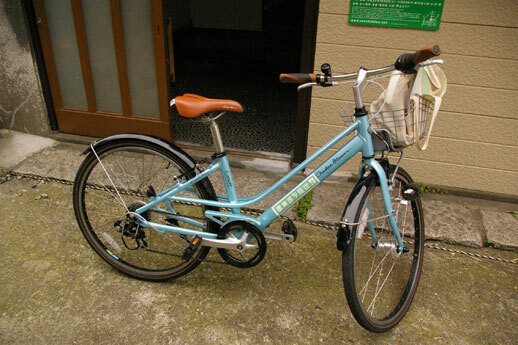 It also rents out bicycles to visitors who would like to tour the area with a set of wheels. Since the various venues are scattered quite far apart from each other, this free service is a real godsend. 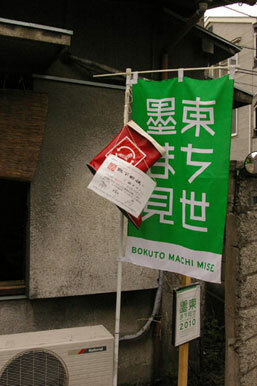 Bokuto Machimise 2010 is the second installment of this festival after the inaugural edition kicked off last year. The first installment featured exhibitions and residencies by 17 groups of artists who live and work both within and outside the Bokuto area. One of the main focuses of this year’s program, however, is a series of “Network Projects” comprising various events organized by individual artists, groups and art-related venues as part of their regular schedules. Bokuto Machimise 2010, therefore, incorporates an extensive lineup of independently-initiated projects with a long-term vision. Located at the end of a shopping arcade leading from Higashi Mukojima station is the Tamanoi Showroom. Since the artist Takahide Mizuuchi used it for last year’s festival, this space has been rented out from a local contractor and converted into a temporary space for various art projects once a month. On display for the duration of this year’s festival is an exhibition by Mizuuchi entitled “Reassembly”, made using dismantled bits of old furniture and electrical appliances. Nearby is the Contemporary Art Factory, which organizes exhibitions and events on an irregular basis. A closing event that summarized the essence of the Network Projects was held here on November 23, the last day of the festival. A short distance along Mito Kaido from Higashi Mukojima in the direction of Hikifune is the entrance to the Hato Shopping Arcade. “Challenge Spot! Suzuki-So”, an old abandoned apartment building located along this street, represents an attempt to breathe new life into derelict properties. 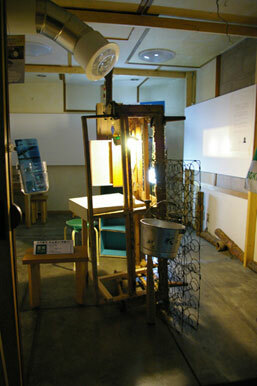 It houses the studios of participating artists Naoko Hiraoka and Takuji Soga, as well as Art Spot Hato-ya, which has been run by the Association of Mukojima Studies since 2008. In addition, shops selling leather goods and custom-made paper products have also taken up residence here. For the “Come Here Santa!” project, which was based out of the Art Spot Hato-ya space, artists created a giant sock-shaped sculpture made from a collection of unwanted socks. 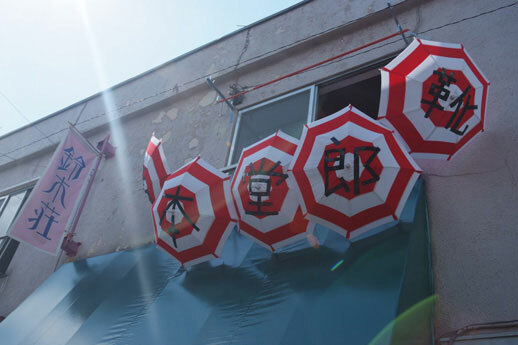 On days when the artist is in, a cheery red-and-white umbrella hangs down from the window. Pua Mana, a coffee shop located along Mito Kaido, also displays artworks and a range of assorted products and accessories made by local artists. 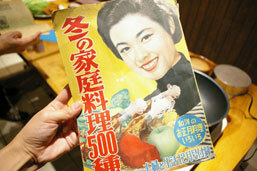 “Retro Cooking Workshops” by artist Eat & Art Taro were held here every Friday for the duration of the festival. During the workshops, participants select a number of recipes taken from old cookbooks published between 1955 and 1975 and test them out for themselves. 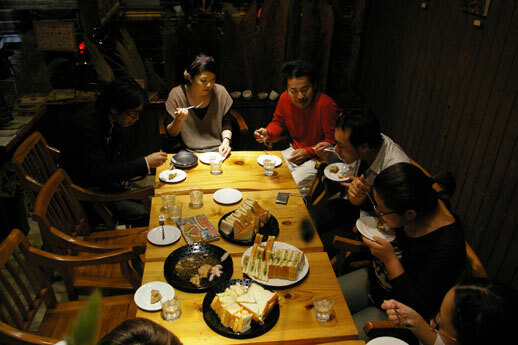 On the day I joined in, we prepared several dishes dating from the late 1950s and early Sixties: sandwiches with three types of fillings – peanut butter and Chinese cabbage in a sour plum dressing, fishcakes and spicy butter, and vegetables in salad oil – as well as dorayaki pancakes stuffed with bonito fish. Looking at the recipes from these cookbooks, we found that they had been written extremely simply. Only a few lines of explanation were included, and quantities and volumes of ingredients were given only as mere approximations. Photos of what the finished dishes were supposed to look like were also missing. With the help of Taro’s directions, we helped out with the cooking while exchanging advice and tips that we had gleaned over the course of our experiments with other recipes. Before we knew it, we had finished preparing the entire meal. There was lots of excited chatting among the participants about how the process of trying these recipes out for ourselves revealed much about how Japanese people actually lived and ate in those days. These rare cookbooks will be on display at the café throughout the duration of the festival, so it might be worth checking out if there’s some “retro” recipe you’ve been wanting to try out at home. 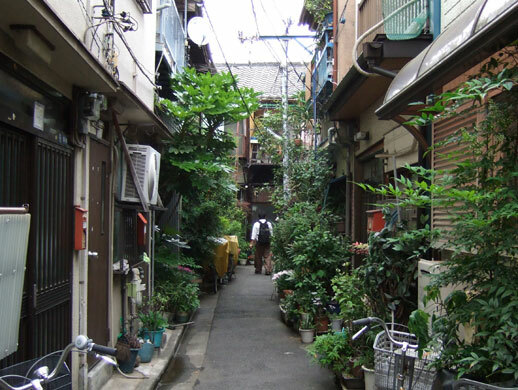 A stroll through Kyojima’s back alleys reveals impressive rows of potted plants that line the fronts of homes and street corners. Each of these leafy groves has a particular arrangement and composition that almost make them resemble paintings. 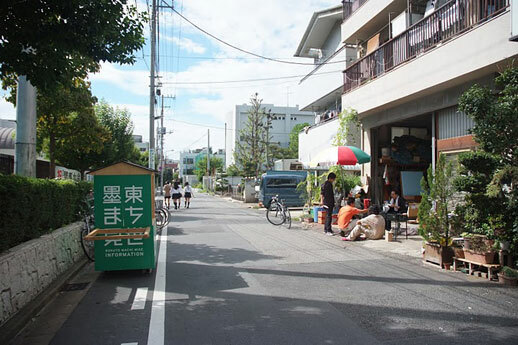 For this year’s Bokuto Machimise 2010, artist Shujiro Murayama, who first picked up on these street gardens, organized the second installment of the Kyojima Roadside Gardening Art Festival after last year’s inaugural edition. Murayama put together a selection of his favorite roadside gardens, organized stamp rallies that take visitors on a tour of the most famous of these landmarks, and asked people to vote for the garden that they liked best. 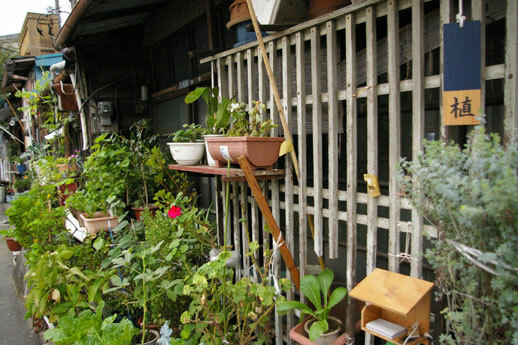 The Mobile Roadside Gardening Art Project, which consists of a little cart loaded with potted plants, is also currently making its way around various locations in Tokyo’s Taito and Sumida wards. Local residents are invited to exchange some of their own homemade greenery with the potted plants on the cart, interacting with each other as a means of bringing people in the community together. Instead of sitting still in front of a house, these plants seem to want to roam all over the city, too. “Wouldn’t it be nice to live like this?” says Junko Konno (pictured right) with a smile. 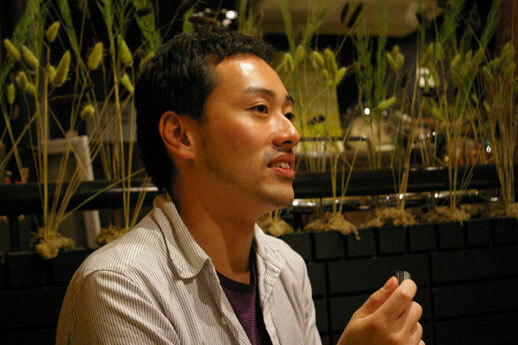 Konno is the leader of the Kosumi Book Renovation Project, which seeks to refurbish old disused shop spaces on shopping arcades and turn them into reading rooms. Suzuki-so, which opened on October 30 on the Hato Shopping Arcade, is one example of these converted spaces. 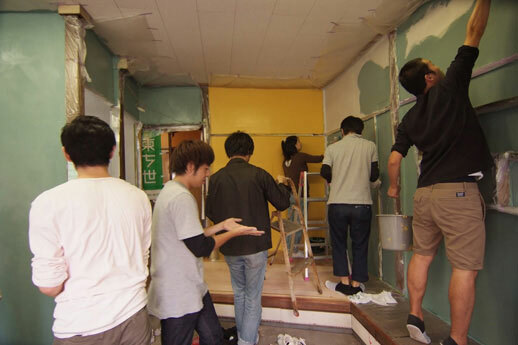 Working in collaboration with participating artists in Bokuto Machimise 2010 as well as local residents, Konno repaints each wall by hand and builds bookshelves one at a time. Architectural students and other people interested in community building also joined a number of workshops that she organized. In pursuing this renovation project, one of Konno’s objectives is to share her working process with those who are similarly interested in giving old, abandoned spaces a new lease of life. Stocked with a selection of novels and exhibition catalogs donated by participating artists and locals, these spaces slowly evolve to become indoor spaces for reading and browsing. 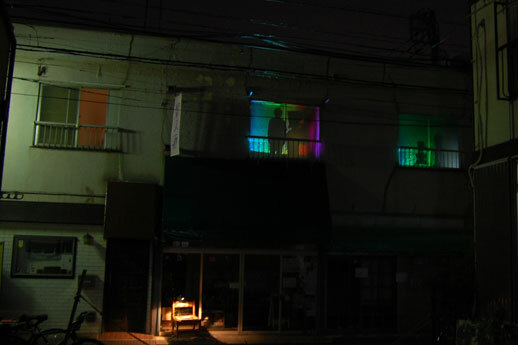 A number of other initiatives running in parallel with these Network Projects are also underway – the 100 Day Project, in which artists pay repeated visits to the area while pursuing a particular art project; “The House of Atreus, Sumida-ku, Tokyo”, a theater program performed inside the House of Atreus (which also houses the information center); and Bokuto University, a local community project based on the metaphor of the “university city”. Based on the premise that a Greek family of theater performers used to live in an old wooden house in the Bokuto area, “The House of Atreus, Sumida-ku, Tokyo” is a project-based performance that enables viewers to rediscover both the house and the neighborhood around it. Audience members are split into groups and led on a tour of the house, during which they follow a trail of clues and fragments hinting at the tragic events that occurred there. Parts 2 and 3 of the performance are scheduled for the middle of next January, while Part 4 is slated for a March showing. Bokuto University is a project that seeks to forge a new, multi-dimensional sense of community between “insiders” (local residents) and “outsiders” (university students visiting the Bokuto area). This initiative was founded by bockt, a three-man unit comprising Fumitoshi Kato of Keio University’s Shonan Fujisawa campus, Tokyo City University’s Daisuke Okabe and Takeyo Kimura, who is also one of the artists participating in this year’s festival. These Network Projects will be carried out on an ongoing basis, changing in form and content as they progress. In addition, visitors will be able to experience different aspects of the neighborhood depending on when they visit. A compelling combination, then – taking the time to explore this fascinating area of Tokyo where old and new meet in unexpected and surprising ways, along with a whole host of art projects that continue to unfold there. *The “Bokuto area” refers to the northern half of Sumida ward bound by the Sumida, Arakawa and Kita-Jikken rivers – the last of which flows just alongside the Tokyo Sky Tree.